Home / Arthritis Symptoms - Symptoms of Arthritis / Gouty Arthritis: Who’s The Prime Culprit? Gouty arthritis puts the day to day life in disarray. It engulfs joints in periods of tenderness, stifled mobility, burning sensation and soreness. Frequent visits to a medical center will help the patients to keep abreast with the current state of their health as the disease has a bad reputation for reversion. It is quiet a segregated malady with a tilting affinity for male population. A surge in blood uric acid level beyond a tolerable range is to blame for joints becoming a house of pain. It’s mysterious why a large number of people with too much uric acid in the blood suffer from no symptoms. While a selected population falls prey to gouty arthritis. Too much uric acid in the blood can lead to its solidification and ultimately these solid particles implant blockades in the way of normal joint mobility. Though there is no sure-shot way to tell if someone will be victimized by the on/off spells of gouty arthritis over their lifetime. Certain people like the long-term alcoholics. Obese and individuals who are over-inclined towards non-vegetarian diet fall under the high risk category. The subtle footsteps of gouty arthritis if heard in advance can prevent it from advancing to a drug-tolerant level. Among the first subtle signs of the disease is painful inflammation of the big toe. Which is more pronounced during the late hours of night. The toe may become so swelled up that even the idea of putting on sleepers may force out a “no” from a patient’s mouth. In some patients, the arrival of the gouty arthritis may be marked by soreness in ankles and knees, and swelling of the big toe may take place later on. The swelling and tenderness associated with the disease. Continue till a week or two and then the state of joints comes back to normal. This is generally followed by an unexpected reversion unless curative measures are followed. Gout does not vacate the system. Without doing away with the crystals of uric acid through medication. One should be in regular touch with the doctor even after getting relief to watch out for any signs of reversion. 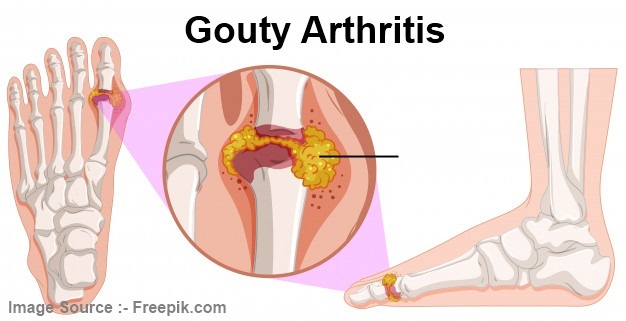 How To Find Out If Someone Is A Patient Of Gouty Arthritis? The evaluation of physical signs and blood sample of a patient will help a doctor to find out if he/she is suffering from gouty arthritis.